Maxim Perepelitsa is a cheerful and quick-witted guy from a Ukrainian village, well-known personality in his native town. He has a fantastic ability to invent all sorts of stories and take time off from work. Having received a summons to the army, wishing to "protect" himself against potential rivals, he sends pumpkins to all the guys in the village on behalf of his beloved girl Maroussi – this is a traditional rejection of courtship in Ukraine which ends up causing a stir in the village. The kolkhoz assembly even wants to deprive Perepelitsa of his honorable duty to serve in the Soviet Army, but Maxim gives his word to correct his behavior. In the army he dodges responsibility when trying to avoid the difficulties of service, but here his trick is out of turn and is arrested in the guardhouse. However his flexible character and good-natured personality make him pliable in re-education. 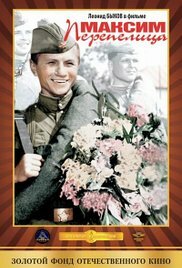 Showing himself as smart and having initiative during a training exercise, he gets the rank of junior sergeant, shows true heroism in his native village during the holidays, and Maroussia finally reciprocates his feelings. Read more on Wikipedia.